I wanted to thank you for all that you have done for my family. Words will never do it justice, but, hopefully can express our sincere appreciation for the wonderful staff of the Apple Tree Orchard. As we breezed in and out and dropped our children, with a minimal “hello” and “thank you” for looking after our children—more than that, for taking time to feed them, provide them with spare clothes as needed, to teach them Spanish, music, Karate, math, science, and reading—we never had the time or took the time to thank you for all that you do. That’s a failure on our part because you do so much. If nothing else, at the end of the three years after entrusting you to the care of our three children, two of which were newly born, we are truly grateful and more appreciative than you will ever know. Every night, my wife and I discussed how fortunate we were to find a “day care center” (the poorest of descriptions for a program such as yours) that was as truly exceptional as it is. Unfortunately, the military is now moving us away, and the bar is set so high, I don’t think we’ll ever find another center as amazing as yours. You will be missed. We recognized every day that our children spent more time in the Apple Tree Orchard than out of it. Actually, our children often complained when they weren’t in the Apple Tree Orchard, unless we were on a road trip. They looked forward to going each day. We even felt guilty on the days that they weren’t there learning. Even our little introvert, Lilianne Grace, though she never showed anything beyond uncertainty and often appeared that she didn’t want to be left, every day and evening, she still talked so much about school and wanted to go back. Scarlett Rose was so excited (putting it mildly) every day we took her to Apple Tree Orchard, and Wyatt was so loved. Apple Tree Orchard touched them for the better, and it will carry them for years to come, even though they are so young. They get more than most kids, according to other parents I talk to, do in their first few years of grade school. I hope that every day, even the days that you are frustrated and exhausted, you feel so proud of your accomplishments. I can only imagine the quantity of children that have come through your program and are the better for it. Please, don’t ever let up. Your patience and perseverance in helping our children through challenging times has certainly been amazing for us. Again, these are all just words on paper, but I hope that it will make you all feel a little more special, as we think you are. Best of luck to each of you in all future endeavors, and best of luck to the Apple Tree Orchard as the program continues. Thank you so much for everything. Thank you again and again for every day with our kiddos. Thank you for making them more than they were. Thank you! From Julia and from our kiddos, Thank you!” – Nick D.
“Apple Tree Orchard is a home away from home for my children. Along the way, we have dealt with the same issues most parents do; leaving our new infants, potty-training, the trying times, the fearful days, the crying phases, the behavioral outbreaks, all the way to graduation into Kindergarten. The entire staff has never failed to nurture, support, excite, and involve my kids; making them confident, positive children, fully prepared to enter school. The curriculum used leaves no doubt in my mind that my children will not struggle with learning. The daily push for exercise along with the healthy & balanced meals has always been important to us, and contributes to their well-being. The weekly additions of music, Spanish, soccer, dance, Kung-Fu, computer time, water-days, numerous special guests and presentations, all ensure a well-rounded child with interest in many different areas. The daily routines and schedules have helped my children learn structure, discipline, and respect. Beyond all of this, and most importantly – my children adore these people. From the Director, to the Assistants, to the teachers…everyone deals with each child they encounter as though they have a vested interest in their future. As you walk through the building, you hear multiple voices calling out the nightly “good-byes” and “see you tomorrows” to your smiling child. You notice the smiles, the hugs, the comfort, directed at your child, and you get a real sense of peace. It is clear that the quiet moments caught on camera, with one-on-one attention and true affection for your child…is exactly what happens on a daily basis as you leave your children in their care.” – Sarah E.
“Our oldest son started at Apple Tree Orchard on the day it opened for business. Since then, our next three children have also attended. Even as babies, all the kids are offered fresh rotations of educational, fun toys. They are exposed to music and Spanish and are encouraged to use their imaginations at play time. As each of my kids started elementary school, they have been more than prepared. They have left Apple Tree with basic Spanish, music, mathematics and reading skills, and the best social skills to transition smoothly into the next level of education. Our oldest child, now in high school has consistently scored higher in reading and mathematics. The younger school children also display advanced reading skills and math aptitude. We highly recommend Apple Tree Orchard as a wonderful place to start your child’s education!” – Virginia N.
“The friendships our children make there may not last a lifetime, but the ability to make friends, be a good friend, and care for others, certainly should. We would recommend ATO to anyone looking for a daycare center, with the feel of a true family.” – Tara C.
“From the caring, knowledgeable staff to the bright facility; the developmentally appropriate activities to the specialized music, dance, and language classes; the modern safety features to the open communication with parents. Apple Tree Orchard creates a fun, structured environment that leads to the social and academic growth of their students. Our daughter looks forward to “school” everyday. We are excited and thankful that we chose Apple Tree Orchard for her!” – Ami N.
“We have sent all 3 of our children to Apple Tree Orchard for the past 5 years. I cannot thank the staff and teachers enough for their care and concern for each of our children. The curriculum is phenomenal and I can say with confidence each of my children were ready to start Kindergarten because of the wonderful instruction ATO gives. In addition to the general learning, ATO provides many added benefits of Music, Spanish, Kung Fu, Dance, and Soccer, which each of my kids loved as well. Such a warm and welcoming place! I am sad to end this chapter in our life, but know that they have a strong foundation of learning due to ATO and staff. Thanks for a great 5 years and I always recommend ATO to any of my friends looking for a fun, safe and caring environment to send their children.” – Renae M.
“Appletree Orchard has been a fun and exciting place for our son to grow, learn, and play! 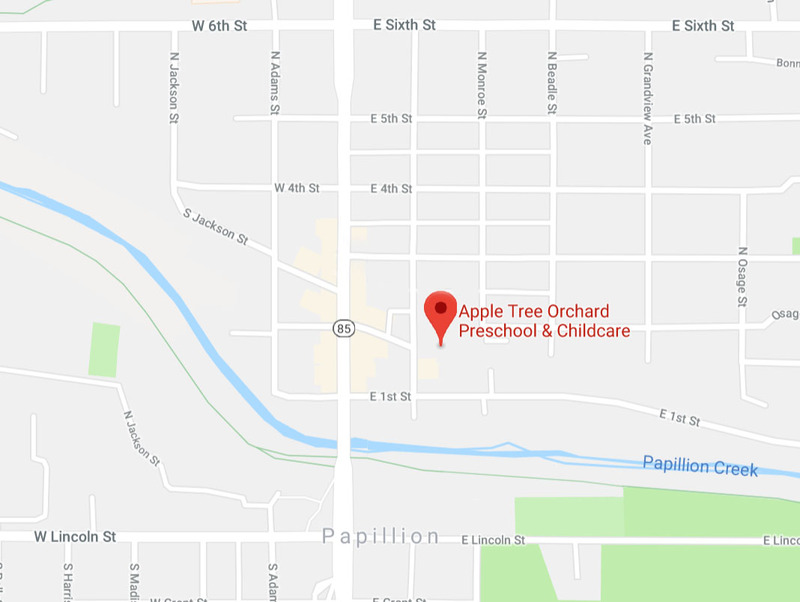 When our family moved to the Papillion area a couple years ago, a family member recommended Appletree Orchard as a wonderful place where opportunities flourish. Appletree Orchard has a safe, caring, and kind environment where my busy son stays active and has fun all day. The structured learning curriculum at Appletree Orchard has prepared my son to be a successful and an independent kindergartner. It’s a joy to be enrolled at Appletree Orchard and know that my son is safe and cared for by extraordinary caregivers.” – Alisha L.
“Apple tree isn’t just a daycare. Our children have the ability to think, process and express themselves at a level that is just exciting to see as a parent! We are so grateful to the Apple tree staff for their continuing commitment to excellence for our children!” – Mary C.
Need more than just day care reviews and parent reviews? Call Apple Tree Orchard Preschool and Childcare at (402) 827-7537 to see what the above parents were talking about.